They also addressed this Marketplace segment on the “death of inflation,” ongoing threats from the financial system, and some ideas for financial reform that are currently being tossed around. On the latter, Wray argued that the idea of a financial transactions tax (being considered by a number of EU countries) is a second-best or partial solution. Instead of sin taxes and other such “economists’ solutions,” as he described them, Wray recommended coming at the problem more directly: by outlawing certain speculative activities and going after practices like high-frequency trading. They closed with a discussion of the prospects of another financial crisis emerging. On the surface, the data from Argentina look awfully good—among the top performers in the world over the past decade. 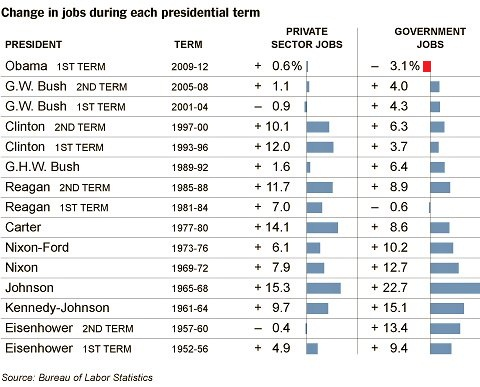 And she’s apparently done it without a run-up of either private sector or government sector debt. In other words, Argentineans have bucked the trend among developed countries, that saw (mostly) tepid growth fueled almost entirely by debt. And that seems to be at least in part due to a policy choice. Argentina had been the poster child for Neoliberal policies all through the 1990s—they adopted virtually the whole Neolib agenda lock-stock-and-barrel. They even adopted a currency board. And unlike Euroland (which also adopted something like a currency board as each member adopted a foreign currency—the euro), Argentina would have consistently met the tight Maastricht criteria on budget deficits and debts over that period. 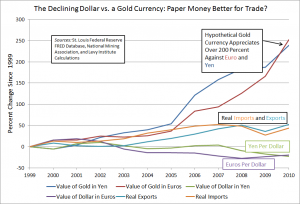 The main purpose of the austere budgets and currency board constraints was to kill high inflation. It worked. But, over that period unemployment grew and GDP growth was moderate. I won’t go further into the problems encountered at the turn of the new decade but the whole thing collapsed into a severe economic, financial, and political crisis. In a last desperation move, the government abandoned the currency board (or, you could say the currency board abandoned the government! ), defaulted on its debt, and created a Jobs Guarantee program called Jefes. A wide-ranging thinker, Mr. McCracken was part of a postwar generation of economists who believed that government should play an active role in moderating business cycles, balancing inflation and unemployment, and helping the disadvantaged. His nearly three years at the White House coincided with a turbulent era marked by rising deficits, rampant inflation, the imposition of wage and price controls, and the breakdown of the system of fixed exchange rates that had governed the world’s currencies since World War II. As a result, by the early 1980s, Mr. McCracken, like other economists, questioned the Keynesian assumptions that had been dominant since the war. He concluded that high inflation had resulted from “a cumulative paralysis in our will” and called for greater fiscal discipline to limit the growth of government spending — a topic that continues to vex Washington…. Working for Nixon, Mr. McCracken was confronted with an inflation rate that had been rising since 1965, a byproduct of the deficits that the federal government had amassed during the Vietnam War….. 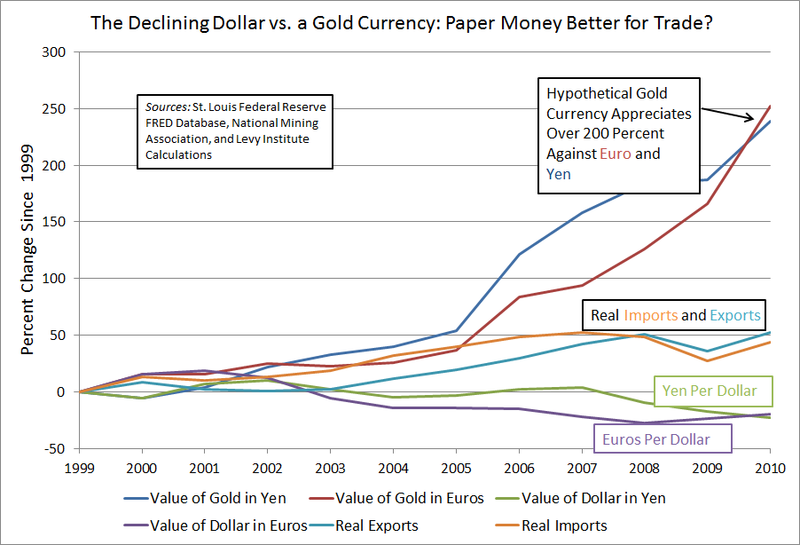 The article paints a picture in which McCracken stood in the middle ground between Keynesian “fine-tuners” of macro policy on the one hand and opponents of “activist” policies, such as Milton Friedman, on the other, who blamed inflation on excessive government spending and erratic growth in the money supply. Can We Afford the Usual? 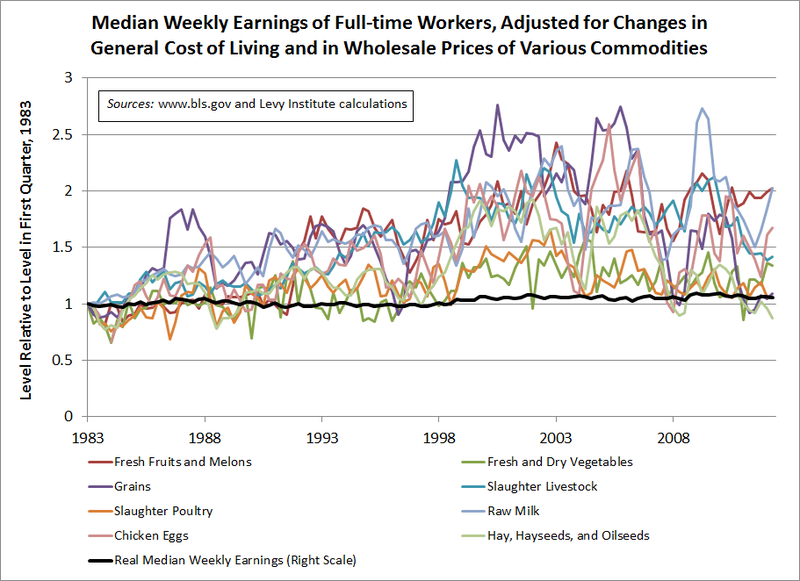 With yesterday’s quarterly BLS data release on “usual weekly earnings” out, I have once again constructed some “alternative” measures of real wages, based on price indexes for food commodities at the wholesale level. 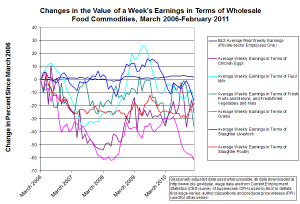 The commodity-based indexes are depicted in the figure above with lines in various colors. 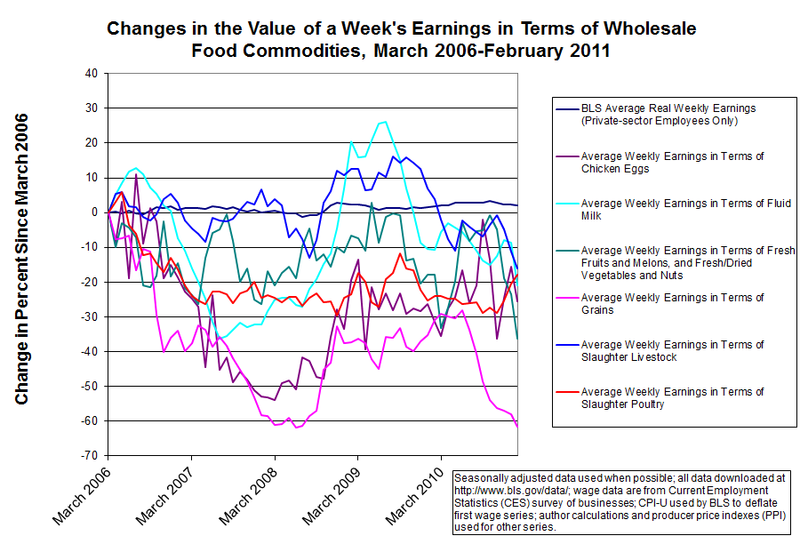 Compared to the more typical measure of real, or inflation-adjusted, earnings, which is seen in black, the food-commodity wages may be of interest in different contexts: for consumers who spend relatively large portions of their budgets on food, for example, or to those following the debate over the unfortunate SNAP (food stamp) cuts in the farm bills recently passed by the Senate and the House Agriculture Committee (see this earlier post). Inflation at the wholesale level is sometimes a harbinger of similar trends in prices paid by consumers at retail stores, so the series shown above may be most helpful as indicators of possible future trends in the standard of living. Along these lines, the Financial Times reports that prices for food commodities will be higher this decade than last, according to two major forecasters. The cited reasons for the expected rise in food-commodity prices include an expected upward trend in the price of oil, climate-related crop failures, and demand from emerging economies. It is best, given that the data are not seasonally adjusted, to look at changes compared to the second quarter in another year. Also, since the commodity-price indexes are rather volatile, changes over fairly long periods are most informative. The second-quarter “real” wage results, relative to the second quarter of 2010, are: in terms of a broad BLS price index, -1.5 percent; fresh and dry vegetables, +10.6 percent; fresh and dry vegetables, +24.0 percent; grains, -38.6 percent; slaughter livestock, -16.0 percent; slaughter poultry, -3.2 percent; raw milk, -4.6 percent; chicken eggs, -14.5 percent; and hay, hayseeds, and oilseeds, -33.1 percent. The results for the past year have been a bit better, with five of the eight commodity-wages rising, along with the BLS’s broad real measure, which has risen .3 percent over its second quarter 2011 level. Update, July 20: I forgot to point out that the run-up in grain prices that I mentioned in Spring and Fall 2011 posts appears to have ended (see purple line) in the data shown in the figure; meanwhile however, certain grain prices are in fact rising rapidly again. As a matter of fact, the Financial Times reported again on commodity prices today, this time on its front page. In a report noting that soybean and corn prices reached record highs in commodities markets yesterday, it observes that the world is facing a new “food crisis,” owing largely to the drought currently affecting crop yields in the United States. “The problem is that we have way too much money chasing way too few good assets. The total amount of financial bets out there is way over $600 trillion around the world. There just aren’t enough good investments to absorb that amount of money. So, what happens is they blow up–one asset after another. Then, those inevitably crash.” Jumping off from his latest post, Randall Wray was interviewed at Benzinga regarding his arguments about a commodities bubble and the potential for a new crash. The Dodd-Frank legislation makes it very difficult to repeat that performance. I’m not saying that they won’t find a way around the rules, or they won’t find a way to do it again. They might, but it’s going to be very politically unpopular. I’m not sure they are going to be able to do it again. Once prices start tumbling, all of the asset markets are actually linked. Even though it’s not obvious, they really are. It will tumble across all of them. And it’s not clear that we will be able to stop it this time. At least, not as easily as last time. Wray responds to critics of yesterday’s post, and includes an excerpt from his policy brief on the topic (for a more condensed version, highlights of the brief are here).